Furnish your dining room with these classical side chairs. The extremely ornate detailing in the legs and chair backs will bring an enchanting style to your home. Slightly arched chair backs will provide comfort and style. 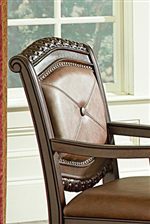 The intricately rippled design on the top of the chair has a Victorian fashion that is extremely elegant. 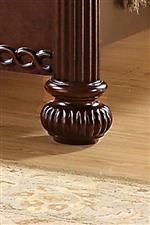 Along with this traditional styled chair are the ravishing arm rails. These arm rests provide extra strength and comfort. The curved features complement the slightly slanted chair backs. Accompany these chairs with a dining table and you will have a complete table setting. Your holiday diners will be extra special with this ornate furniture setting. The Antoinette Traditional Upholstered Dining Side Chair by Steve Silver at Walker's Furniture in the Spokane, Kennewick, Tri-Cities, Wenatchee, Coeur D’Alene, Yakima, Walla Walla, Umatilla, Moses Lake area. Product availability may vary. Contact us for the most current availability on this product.